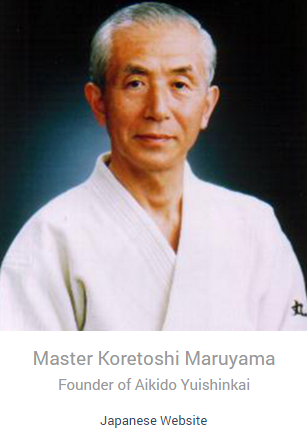 Aikido Yuishinkai, the school of “making the impossible possible”, was founded by Master Koretoshi Maruyama in 1996. Master Maruyama, former direct student of Aikido Founder Morihei Ueshiba for 13 years, former Aikikai Hombu Dojo instructor, and former director of the Ki no Kenkyukai(founded by Koichi Tohei, 10th Dan) spent 10 years meditating in a temple in Saitama prefecture on the essence of mind, before leaving with the blessing of the High Priest to establish his Aikido School. Master Maruyama teaches us the Aikido that he learnt from the founder of Aikido, Morihei Ueshiba and emphasises this as “true budo”, a way to overcome the desire to compete or be in conflict with anyone. As such, the Aikido in Yuishinkai dojo is unique in its principles, and philosophy. Heavily influenced by traditional Japanese sword and the zen teaching of mind and specific to our school are the teachings of T-step, moonshadow foot and Shinbashira(centrepole) training. Sensei teaches there are four levels to our Aikido. Kotai is basic, as is Juntai. At these levels one is practicing Kata to begin to understand principles, as well as beginning to understand the role of ukemi, the art of receiving technique. Ryutai is the level of flowing technique. It is dynamic and alive. This is when one starts to practice real Aikido, and utilise the principles learnt in the previous levels in an environment that is more akin to reality. Reitai is the level of emptiness. At this level one is not reacting to external stimuli, but rather controlling the space and time around them. This is the level the founder call Takemusu Aiki. At this level ones ukemi must also be devoid of the hurdle of the cognitive process, always extended, always relaxed. Aikido Yuishinkai Australia, through their chief instructor has put a great emphasis on repetition of basic movement to create integrity of form. Ukemi is taught as part of the learning process integral to the understanding of basic principles, and the adaption of relaxation and connection. Aikido In Yuishinkai dojo in Australia are taught in a relaxed joyous manner, inclusive and open to all ages.